This was originally going to have stockings for the first 24 days of December, but I didn't have time to finish it by the beginning of the month, so we have a 12 days of Christmas garland instead. 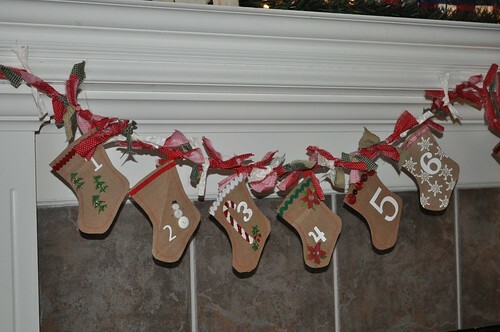 The stockings are made from grocery bags, machine stitched together with a zigzag stitch. 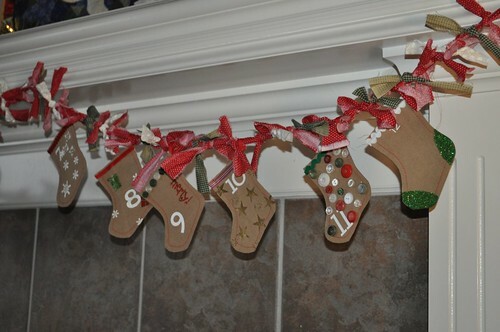 They are decorated with ribbon, rick rack, buttons, glitter, and stamped embossing. My friend Lorilee let me borrow a lot of her stamping supplies for this project and I'm so glad she did. I really like the #2 button snowman. The trim on #3 is an elastic that came wrapped around one of my orders from Sewzanne's a while ago. Don't you love the gold embossing on #10? I have to say I really like the glitter heel and toe on #12, and #11 button stocking is my favorite of them all. 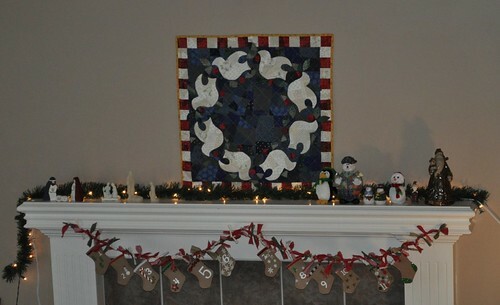 Oh yeah, I also wanted to make sure you noticed my Wreath of Doves quilt hanging on the wall in the first photo. 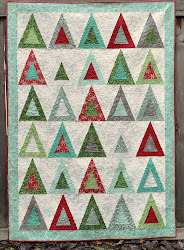 If you haven't voted in the Holiday Traditions Quilt Contest, you can go vote for this quilt of mine. (Scroll down to the small quilts contest.) Thanks! I love the advent garland! What a cute idea! Awesome! And I voted for you too! Your quilt is beautiful. But I also love the insight on your stockings. Great idea. Thanks for sharing.